The earliest towns appear to have developed in the middle of the 3d millennium B.C. without any influx of foreign immigrants. They were small communities but already practicing such arts as the weaving and dyeing of cloth. Some of the pottery shows an elegance of line, even if its painting is not distinguished. The first palaces were built about 2000 B.C., and to that period should be ascribed the first grouping of settlements into petty states. The palaces were shattered by a major earthquake about 1700 B.C., but were immediately rebuilt on a grander scale. They continued to flourish until about 1450 B.C., when a sudden disaster overwhelmed all but Knossos. In the subsequent Late Minoan II and III periods (1450–1200B.C. ), it is now believed, the rulers of Crete were Greeks. But there is no doubt that the earlier language of the island was not Greek, though its affinities have not yet been reliably determined. Despite possible parallels elsewhere, the culture gives the impression of being a unique, indigenous growth. The palace of Knossos was burned about 1380 B.C., and it was probably never rebuilt on a large scale, though the site continued to be occupied. 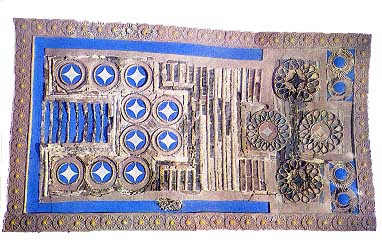 The Greek period is not usually recognized as more than a phase of the Late Minoan, though the warrior tombs, the throne room, and other features at Knossos betray mainland influence. 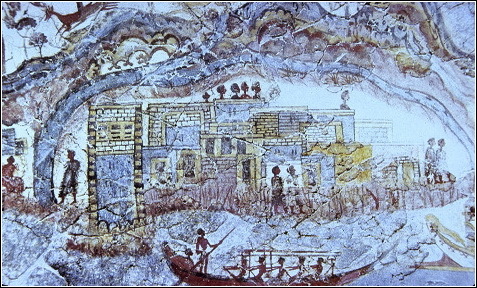 Still disputed is whether a Greek-speaking population survived the fall of Knossos. There may have been a local revival of Minoan culture, but in historical times only small areas of the island retained traces of non-Greek speech.